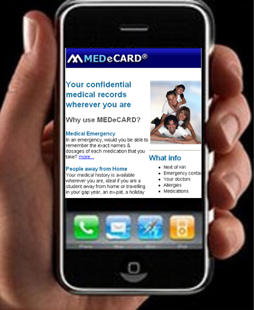 MEDeCARD is a secure and confidential system that lets you store, update and share your medical records anytime, anywhere. Your medical records are available to you and health professionals anywhere in the world. Have the information to complete forms whenever you visit a practice or hospital. What information can I store in my MEDeCARD account?